When it comes to automotive refrigerant management equipment, all products are not created equal. That is why Best Buy Auto Equipment proudly offers the latest in ease and endurance with the revolutionary CPS FX1234 Advanced 1234YF Recovery, Recycle, and Recharge system. This all-inclusive refrigerant management center will help you and your technicians efficiently recover, recycle, and recharge automotive A/C systems suffering from weak airflow, leaks, and other symptoms. Plus, this machine monitors filter life and refrigerant usage for you, so you can focus on providing the best possible service to your customers. What sets the CPS FX1234 Advanced 1234YF Recovery, Recycle, and Recharge machine apart from competing refrigerant management centers is that it is built by technicians for technicians. Thanks to its cutting-edge user interface, this system dramatically simplifies operation and eliminates the guesswork with the help of on-screen instructions. Unlike the solenoid valves used by competing products, each FX1234 system uses patented motor-controlled ball valves that greatly improve flow rate and reduce possible obstructions caused by contaminants. 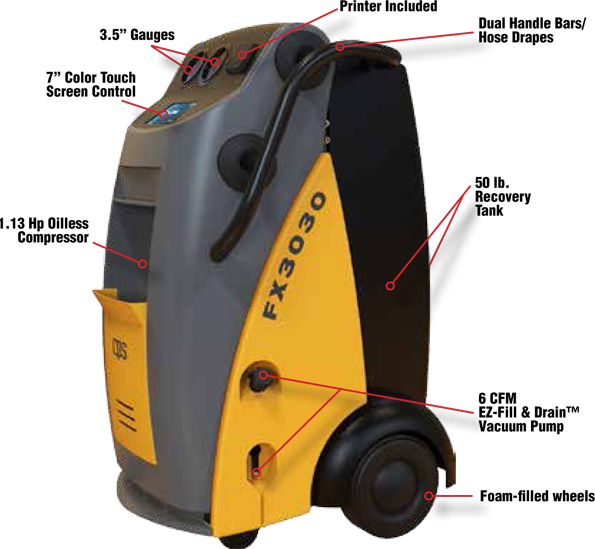 What’s more, every CPS FX1234 Advanced 1234YF Recovery, Recycle, and Recharge system comes fully equipped with a complimentary A/C Systems capacity database and the user interface supports multiple languages as well as units of measurement. Your technicians can quickly access all functions from the main screen. In manifold mode, they can even print snapshots of pressures before and after service. 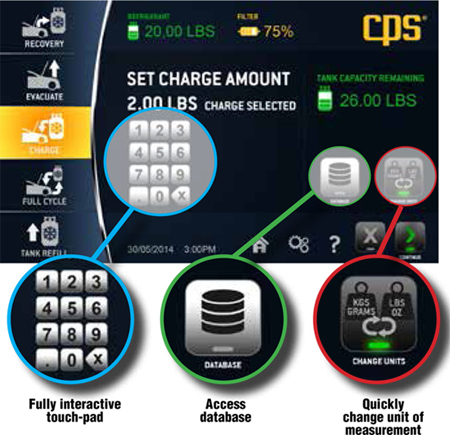 Discover the CPS advantage by choosing this system for your automotive shop today. We offer interest-free financing options for up to six months, so you can stay true to your budget. Please let us know if you have any questions about the all-new FX Series offered by CPS Products. Dimensions H 47.5" x W 27.5" x D 25"